The Red-fronted Macaws (Ara rubrogenys) - also known as Lafresnaye's or Red-cheeked Macaws - are medium-sized, highly endangered macaws found in South America. Less than a thousand of them still exist in the wild (some estimates list as few as 150 surviving birds). illegal trapping for the pet market. However, they have been doing quite well in captivity and are reproducing successfully. Even though one can't consider them "common" - domestic-bred birds can usually be found. In the wild, these parrots are generally social and always found in groups, except during the breeding season, when pairs separate from the flocks. Outside the breeding season, they are usually seen in small flocks of 3 to 5 individuals; or even up to 30 when foraging or roosting. Roosting birds are often seen in playful interactions, such as pecking at each other, beak wrestling and fencing, alternating jerks of the body while on branches, and tossing objects to each other. These powerful fliers can reach speeds of up to 40 miles per hour (64 km / hour). 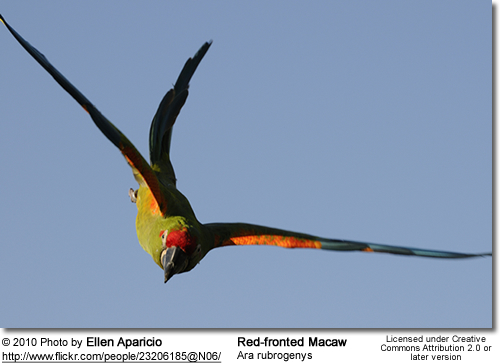 Red-fronted Macaws occur naturally in the small semi-desert mountainous area of south-central Bolivia, South America, where they are found on the east Andean slope at elevations from 3,600 - 8,860 feet (1,100-2,700 meters). Their range stretches from south Cochabamba valley and western parts of the department of Santa Cruz through northern Chuquisaca to north-east Potosí. The largest populations are found in the valleys of Ríos Grande, Mizque, Caine and Pilcomayo. They inhabit subtropical, xerophytic thorny scrub with many cacti, scattered thorny trees and scrub, in a climate that semi arid with cold nights and hot days. 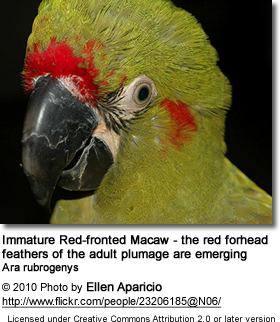 This is the only macaw species living in such a climatic zone. 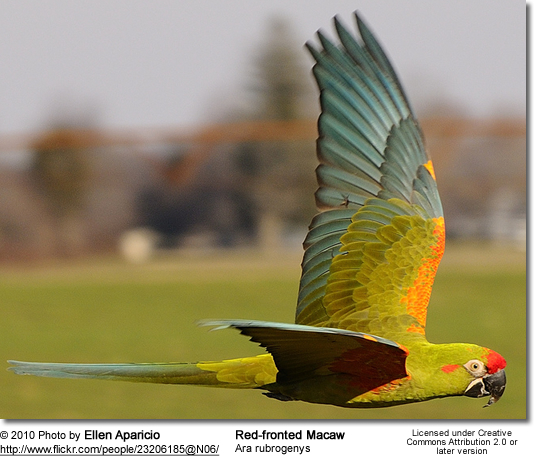 Due to capturing for the pet market and hunting by local farmers, who consider them crop pests, the population of Red-fronted Macaws has declined considerably over the years taking this species close to extinction in the wild. In 2011, during a survey 130 pairs were counted, of which 67-86 were breeding and the rest - about 545 individuals - consisted of immature birds or non-breeding adults. Thus the total population at that time was about 805 individuals (A. Rojas, F. Hiraldo and J. L. Tella in litt. 2012). Red-fronted Macaws measure 21.5 - 25 inches (~ 55 - 63.5 cm) in length - including the tail; and have a wingspan of about 32 inches (81 cm). They weigh between 15 - 19.4 oz (425 - 550 g). 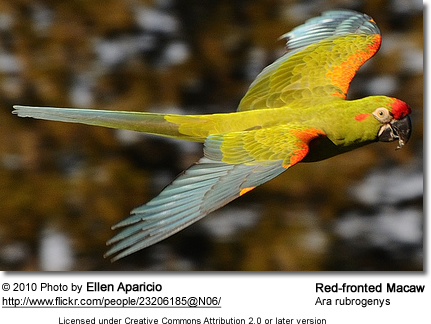 The plumage is mostly green, except for the orange-red forehead and crown (hence this species' common name), a red patch over the ears, red "shoulders", medium-blue to teal-colored primaries (longest wing feathers) and reddish thighs. The olive-green tipped tail ranges from green to teal-blue, except for the underside of the tail, which is yellow. There is a little bare patch of pale skin around the eyes. The large beak is greyish-black, the feet are grey, and the eyes orangey. Juveniles either the lack the orange-red patches on the forehead or crown or these patches are diminished. The wings are entirely green and the thighs are green with an orange tinge. Their eyes are brown and the tail is shorter. 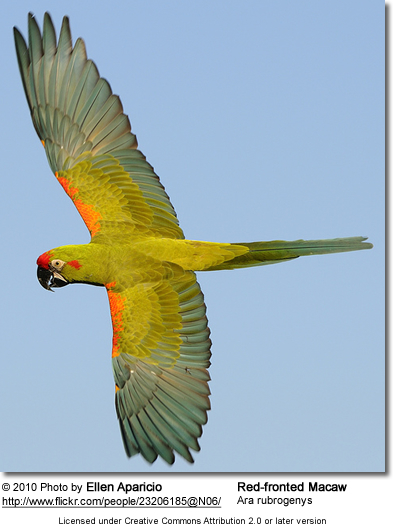 Military Macaws are larger in size and they don't have any red markings on the wings. Their diet consist of seeds, nuts, fruits (such as the fruits of the Jatropha hieronymii), vegetables and various vegetation - including grasses and cacti, from which they also obtain a lot of the water they need in their dry habitat. They also often chew on sticks or tree bark. In some areas, they also feed on cultivated crops, such as groundnuts and unripe maize, resulting in them being hunted and killed by local farmers. Red-fronted Macaws form close, lifelong monogamous pair-bonds and even outside the breeding season affectionate behavior between them can be observed, such as mutual preening, nibbling each other's face feathers or grasping their mate's beak - even copulation. They only nest once a year and that occurs mostly between October and April. 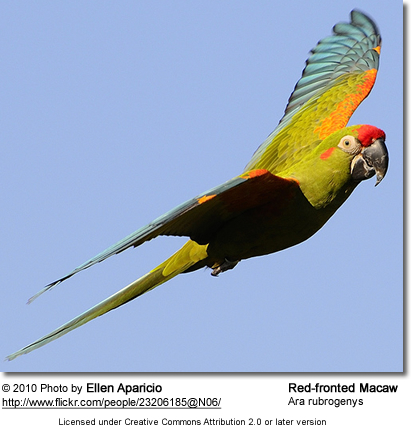 Most other macaw species nest in tree cavities, but since their natural habitat often lacks suitable trees, they usually nest in crevices of undisturbed, steep-sided cliffs of river-side canyons and rocky gorges, although one small population was observed breeding in palms. A clutch may consist of 1 up to 3 eggs which are incubated for about 26 days to hatching. Both parents tend to the nest and the chicks, and once the young have fledged, the young and their parents usually join large flocks and most activities, such as feeding and roosting, are performed communally until the next breeding season, when pairs are getting ready to nest again at which time they will separate from the flock. Even though these parrots are not generally territorial, breeding pairs will defend the area immediately surrounding the nest. 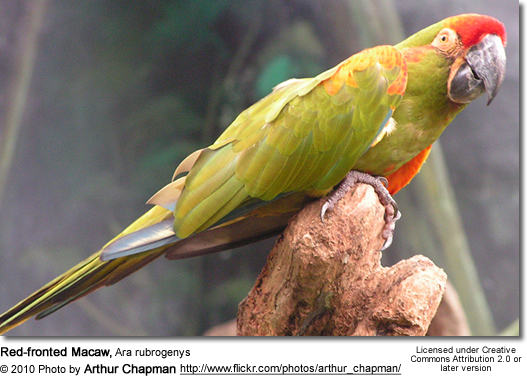 Their calls, given in flight or at rest, are described as musical and high-pitched notes, shrills, ringing and growls and some squeaks, but lacking the harsh, screechy quality of other larger macaws. Pairs may sing in duets, beginning with one loud squawks and declining into soft coos and chuckles.